Free-standing rock and cedar guest house ~ 750 sq ft. First bedroom with queen bed. Second bedroom upstairs with full bed and day bed. Full bath. Full kitchen. Living,dining and kitchen combined. Roofed porch with swing and glider.. TV/DVD, Netflix. Wireless router. Deck 100 feet below cabin overlooking creek. Beautiful view of Hill County from porch. Gas grill available for your cookouts. Ping pong table with paddles and balls. David Boyd, retired from UT Austin. Patti Boyd, semi-retired from self-employment. We both have lived in Austin area for about 50 years, and have lived at this property since 1995. It is incredibly beautiful, truly, and a very natural area. Austin seems to grow daily, but our place here, only 30 miles from downtown, feels a world away. It is very a peaceful, relaxing place to be, a real getaway from the hustle and bustle. The view from the cabin is phenomenal. Sitting on the porch and relaxing in the swing or glider and enjoying the view of Cypress Creek canyon 120 feet below is a mind-altering experience. It really takes you out of yourself for a bit. If you're a bit adventurous, you can climb down the custom-built iron staircase and trail to an incredibly beautiful deck built on a boulder overlooking Cypress Creek. It feels very much like a giant treehouse, with the sound of the falling water running down below. Downtown Austin is only 30 miles away. Unobstructed view of the hills of the Texas Hill Country from your front porch. View of Cypress Creek canyon 100 feet below cabin. Beautiful dining area with large bay window looking out on natural area. Netflix is available on Roku, but not satellite channels. Lawn around cabin with flowers, plants and shrubs, etc. Large covered porch with glider and chairs, hammock chair. 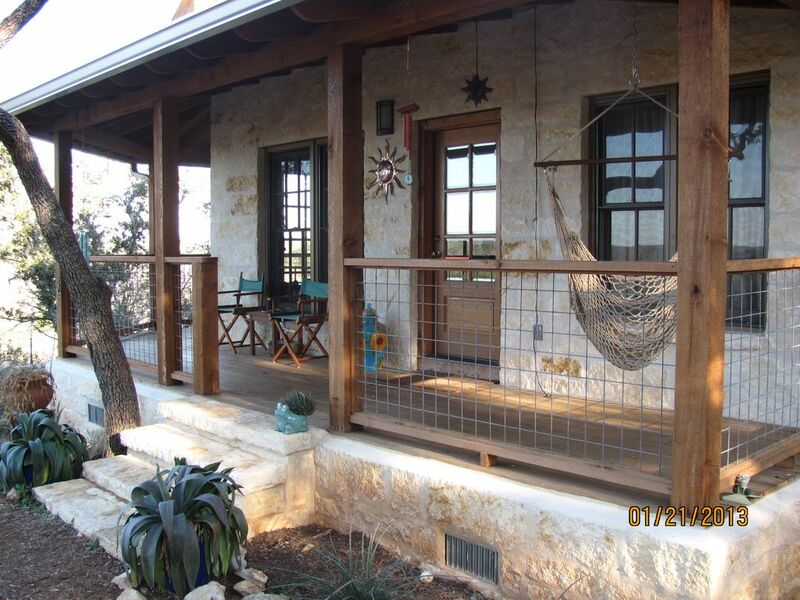 Wonderful hosts, clean and fully equipped cottage in a quiet, beautiful location in the Hill Country. The numerous hummingbirds were amazing. Looking forward to return sometime soon. 4th time and it won't be the last. It's perfect! Great View of the hills! Property owners were very sweet and accomodating. The breakfast was great! Nice place to stay with room for kids to run and play outside. Hamilton Pool Park is 2 miles and Reimers Ranch Park is 3 miles. We are about 30 minutes from the world famous Salt Lick Barbeque in Driftwood. Fredericksburg is about 1 hour away with many wineries along the way, the closest of which is one-half mile away from our gate.